This is a beautiful antique forest green and gold metal table lamp. The base and stem are metal with some patena and light scratching. It is in original working condition including the wiring. The plug is damaged and has electrical tape but the lamp still works. It should probably be rewired and is sold as is. I believe it is from the 1910's to 1920's. It has an F marking on the switch. 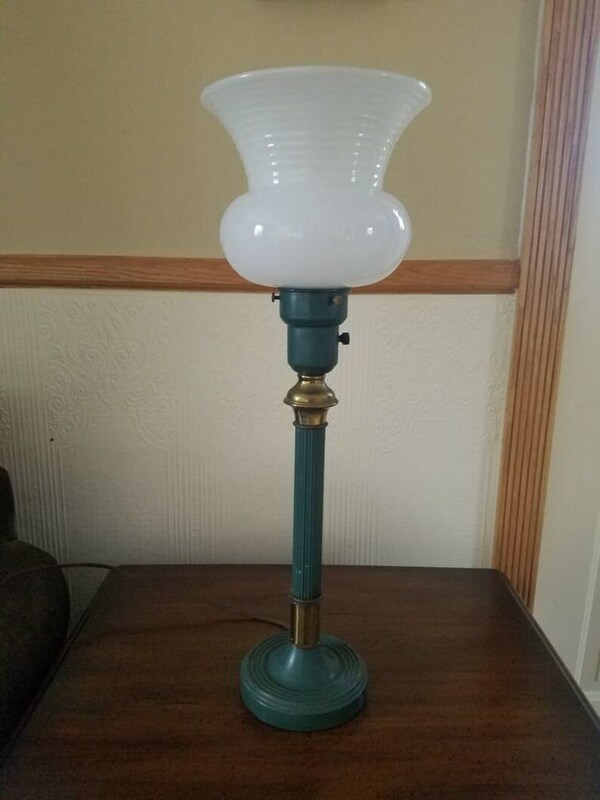 The condition of the lamp is good for its age. The globe has no chips or breaks and the shade is in excellent condition. This lamp could work in many settings including farmhouse, shabby chic,victorian, mid century,country or vintage. It measures 26" tall bottom to top of shade . 6 " square base. The metal stem is 17" and the globe is 7"